Ever since I attended the launch of Benefit's new Brow collection last month, I've been dying to talk about it but as a result of a strict embargo, haven't been able to... until today. Everything about the launch has me excited- from the well executed event, the brand's long association with brows to, of course, the products themselves which live up to my high expectations. As aforementioned, Benefit has a long history of solving brow dilemmas. Since the first boutique opened in San Francisco in 1976, Benefit has over 1800 BrowBar beauty lounges in 49 countries. 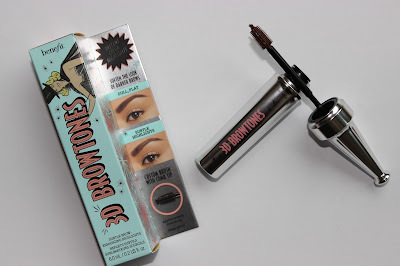 Rightly so, Benefit see themselves as authorities in the brow arena and as a result, the collection has been created to target & solve each & every brow dilemma whether it be sparse brows, patchy brows or unruly brows. In the same way that women now treat, colour & style their hair at home & have reduced their reliance on traditional salons, Benefit hope that the new collection will empower women of every generation to become their own "brow experts". This is reiterated through an easy-to-use online brow product advisor on the company website along with the inclusion of a Magic Tips & Tricks leaflet with products. The Brow collection has been three years in the making and features thirteen products, in high-performing formulas, mistake-proof & believable shades and with custom-designed applicators for ease of use. Of course, as you'd expect from Benefit, the packaging is fun whilst also being functional and the product names are quirky & memorable. I've long been a firm believer in the power of brows. I grew up in the 1990s when the aesthetic was "the thinner the better" & this extended from Heroine Chic seen on the catwalk models to women's faces, evident by a simple glance at their brows. Brows have the power to frame & lift the face, making it appear more youthful. A straight brow can give an androgynous appearance whilst a high arch can help to balance a rounded face. As we've moved on from simply tweezing at home, brow products have become as essential a part of our regime as mascara. First up, the UK's best-selling brow product, Brow Zings has been given a makeover. Still costing £24.50, the colour range has been expanded from three to six shades. The adorable mini tweezers which were contained in the original Brow Zings are still included but the two mini brushes, which I think most people found fiddly to work with, have been replaced by an extendable double ended brush. It's better because the longer handle allows for greater control but I have to confess that I find the extendable brush rather flimsy. Comprising a mirror, tools, wax & powder (with the promise of up to 12 hours wear), this handy compact contains all you need to tame & shape brows. The UK's second best-selling brow product is Gimme Brow. Frankly, I'm surprised that it's not the best-selling product and I assume that this is owing to it being a newer launch. I'm yet to come across someone (particularly those with skimpy brows) who's tried Gimme Brow & not loved it so it's easy to see why it's "inspired" countless imitations. As such, despite the product receiving a makeover, it remains just the same, fantastic product with the simple addition of a further shade so there's now three to choose from. The mini wand (it looks like a mascara wand for cats!) is undeniably cute & allows for a controlled, precision application of the water-resistant, tinted brow gel, which contains volumising micro fibres to create natural looking fullness & definition. I love Gimme Brow because it delivers on the claims, is long-wearing and doesn't feel or look crispy or uncomfortable to wear. The new design contains the same amount of product as the original and there's been no price change (I'm relieved there's no increase as I've always thought that it should be a few pounds cheaper) on the original £18.50. The new collection also features some new brow tools and whilst it's difficult to get excited about such things, they've been created with such attention to detail that I can't deny that I'm impressed. Slanted tip tweezers which feature diamond-dust coated tips for superior grip have a bristle brush at one end to groom brows into place, without getting in the way when the tweezers are being used. The built-in brush is such a simple idea but one which is so handy that I can't believe I haven't come across tweezers with it before! I feel that it justifies the £15.50 price tag. There's also a double-ended angled brow brush & spoolie for shaping & defining brows. It's not ground-breaking & as a result, I'd probably struggle to justify the £15.50 price tag on this one but nonetheless, it's the type of tool which I view as an essential within any collection. There's also an all-purpose sharpener (which I don't have) costing just £4, which can fit three sizes of pencil from standard to jumbo & it comes with a built in blade-cleaning tool. Eyeshadow, face and even lip primers are now considered essentials within our makeup regimes but what about a primer for the brows? Browvo! Conditioning Primer is designed to work well as a base under brow makeup products, helping to enhance both colour & extend wear whilst the nutrient-rich formula (which contains keratin & soy proteins, known to help brows look thicker, healthier & fuller) boasts conditioning benefits so that it boosts the natural appearance of brows over time. Browvo! Conditioning Primer is presented in a twist up pen with rubberised tip for ease of application and is a clear gel which can be worn under makeup without interfering with its integrity or alone (even overnight!). At £21.50, it's not an essential within the collection as far as I'm concerned but admittedly, I haven't been using it for sufficient time to comment on the long-term benefits so it may be worth a look if sparse brows are a concern. Personally, I find brow pencils the easiest way to fill in my brows. I was surprised to note that there's not just one but two brow pencils to choose from in the new collection (I feel that this is unusual) so there really is something for everyone. I find it particularly helpful when brow pencils are double-ended so as to incorporate a spoolie (in fact, it's a bugbear of mine when they don't!) so I was pleased to note that both brow pencils in the collection boast this feature. The brow pencils are available in six shades & claim up to 12 hours of waterproof wear. Each of the brow pencils costs £18.50 but it's worth noting that there's more than 3x the amount of product included in the Goof Proof Brow Pencil than Precisely, My Brow Pencil. As the name suggests, the Goof Proof Brow Pencil is designed to be particularly quick & easy to use, making it the ideal choice for beginners. It features a retractable (no sharpening required) slanted tip pencil. The wide tip is handy for filling in uneven patchy brows (which I suffer from & therefore, love this format), whilst the pointed tip is useful to creating definition. As above, the other brow pencil in the collection is called Precisely, My Brow Pencil. As the name suggests, this one is designed to give a precision application and is particularly targeted at those with shapeless & undefined brows. I don't own Anastasia's bestselling Brow Wiz but the fine tip, specially designed to create hair-like strokes, makes me think of it. The packaging design is as well thought out as the product itself, with a retractable, no-sharpen functionality and a textured grip area. For those who favour a pomade style product, it's worth checking out Ka Brow! This cream gel (available in six shades) can be used to fill, sculpt & define brows and provides rich colour that promises up to 24 hours' waterproof wear. It's a good choice for those who like to be creative with makeup as it allows users to build up their brows from a natural to dramatic look. Built into the lid is a brush which can be removed, flipped & inserted back into the lid (doing this gives greater control during application). It costs £18.50 for 3g of product but as a little goes a long way, the product will last a long time & therefore, provides good value for money. Another product which recognises that many are now rather advanced when it comes to home brow care & as a result, are happy to be creative, is 3D Browtones which is a brow highlighting gel. This unusual product can be used on lighter brows to enhance their appearance, darker brows to soften the look or added as highlights to give more depth to natural brows. The brush features spiral bristles for even, mess-proof application and a mini-comb tip to fill the narrowest part of the brow. The single shade product is water-resistant for up to 12 hours wear and can be used alone or with other products from the collection (many are designed to be used in this way). It's by no means an essential, particularly when you consider the £18.50 price tag- in fact, I feel that of all the products in the new collection, this is the "added extra" which is designed to take brows to the next level. When it comes to setting brows in place, clear brow gels are plentiful on the market and therefore, there's many affordable versions. As such, it's hard to justify the £18.50 price tag of Benefit's Ready, Set, Brow. That said, I appreciated the long-lasting control it provided, without crispiness or flakes. The rubber bristled wand features short bristles on one side to sculpt & shape hairs into place, the precision tip is designed to provide definition to the tail of the brow and long bristles evenly coat each hair, from root to tip, making it quick & easy to apply. As a finishing touch, the collection includes two highlighting pencils. High Brow (a matte, linen pink for a natural looking finish) and High Brow Glow (subtly shimmering Champagne) are designed to be applied under the brow arches to give a brightened, lifted and more youthful appearance. The pencil format means that they're also ideally suited for creating a precision highlight on areas such as the tear duct or Cupid's bow. I love the colours and finishes but I wish that the pencils didn't require sharpening. Equally, I'd have loved to see a sponge incorporated at one end for on-the-go blending of the creamy formula (although I appreciate that some people find this unhygienic), which I feel would have made the £17.50 price tag a little more acceptable. As a point of reference, shade 4 in the new Benefit brow collection works well on my brows, for which I usually use MAC's Lingering pencil, Maybelline Medium Brown or Tom Ford Taupe. On the whole, I can't recommend Benefit's new Brow collection highly enough. I really do feel that it delivers on the claims and that there's something for everyone. It launches on 24th June.